After the snow last week I was determined to be prepared for a vase this Monday, as I always like to join in this meme hosted by Cathy at Rambling in the Garden when I can. So a few grasses and hazel catkins were gathered during the week. I then added dried Sedum and some poppy seedheads collected in the summer and autumn. I came across this coffee pot, hiding away in a cupboard, and decided it looked quite festive and was perfect as a vase! There are also a few cornus twigs and some Mahonia foliage which is drying up fast as I haven’t added water to the vase. This morning Hippeastrum ‘Lady Jane’ decided to open yet another flower for a snapshot too. She is definitely at the top of the list for next year’s bulbs as she has flowered beautifully on relatively short stems. Here you can see her alongside my second festive vase filled with fir and larch cones and Silver Fir needles from the garden (with a couple of shiny baubles!). If you only visit my site for the Monday vases, then I would like to wish you a very Happy Christmas and a joyful festive season! This entry was posted in Garden, In a Vase on Monday, Traditions and tagged Christmas, Cut Flowers, Garden, Winter. Bookmark the permalink. How remarkable, to create such festive displays on the cusp of winter! Merry Christmas, Cathy! Thanks Deb. Merry Christmas to you too! Wonderful and so festive! Love your vases this week, Cathy! And I meant to mention this a while ago but forgot…your header photo is beautiful as well! I like the vase filled with cones etc, it just shows there is no need to spend a fortune on glitzy ornaments from China when with a little thought you can make something so much nicer. Cathy your first vase I love for the hazelnut canes and the dry sedum: and of course for the teapot that is beautiful and makes a vase. Your second vase is marvellous because you demonstrate that with what you can pick from nature and two bright red stones you make a vase and adornment for these low cost parties. Cathy, I wish you a Merry Christmas full of health, peace and love for you and yours. Happy Holidays! Greetings from Margarita. Thank you Margarita. And warm wishes to you too! All of your vases look so festive. Happy IAVOM. Thanks Cathy. This Hippeastrum flower is the third, and the white one I showed a couple of weeks ago has also got a third bud, so they have done well so far! Oh three buds is especially good – hurrah for your floriferous hippeastrum! Thanks Annette. It isn’t a Kachelofen but a Kaminofen which has a closed front – it gets really hot and the stones retain the heat nicely. Always fancied a Kachelofen though and like to sit near them in Bavarian restaurants! 😀 Have a wonderful Christmas! The red coffee pot is perfect for the season. Have a Blessed Christmas. Thank you very much John, and the same good wishes to you and your wife. I love that second vase! It’s simple and very clever at the same time and I may well copy your example using materials more characteristic of my own area. That Hippeastrum is gorgeous. I have 2 growing in my kitchen windowsill waiting to be handed off to friends tomorrow – I hope they’ll be at least half as pretty as yours when they bloom. Best wishes for a very merry Christmas, Cathy! Lovely,I love the fir, pinecone under glass. Lady Jane is a keeper. Happy Christmas to you. What a triple treat you have for us this week, Cathy! I’m glad you included H. ‘Lady Jane’ – she is lovely and I love the idea of greens, cones and red ornaments in a clear vase. I might borrow that idea! Festive displays! 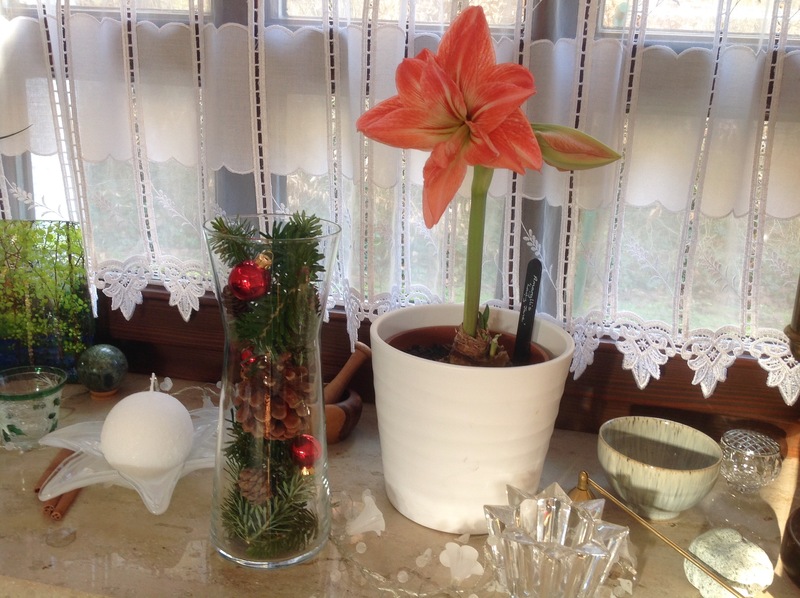 The red coffee pot is lovely and the amaryllis must bring great joy. Happy holidays Cathy! What a beautiful coffee pot vase, Cathy. 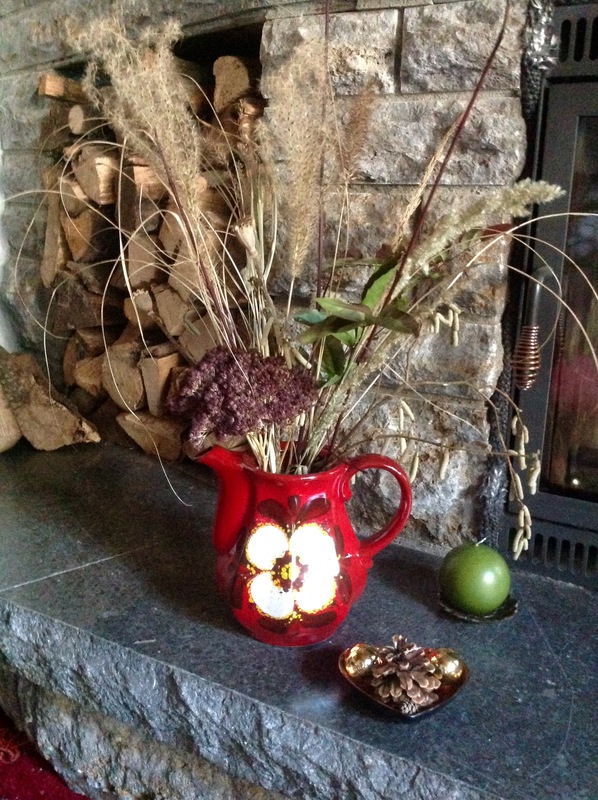 It’s perfect with the holiday red in contrast to the earth tones of your dried arrangement. You have such a wonderful eye! I hope you, too, are enjoying this holiday season and have a very happy Christmas! Thank you Debra. Wishing you a joyful Christmas too! It’s all looking very festive. The red really sets off the dried heads and that’s a great idea to fill the vase with greenery. Glad I could inspire! You have such lovely ideas too, with your lovely lights… I wondered if I could use lights in a vase actually, but I don’t have a glass vase large enough! Merry Christmas Karen! I love the tall vase with the greens and pinecones. I’m inspired to try that myself. Thanks for the inspiration, Cathy. Happy Christmas! Hi Alys. The glass vase idea is so simple, and I am sure you would be able to add your own creative twist to it. 😉 Happy Christmas Alys! PS….and I love the coffee pot! The coffee pot is just right Cathy. Wishing you a Happy Christmas. Thank you Brian. Hope you and your family have a wonderful Christmas! You are festive, for sure! I really like the glass vase with the evergreens, the cones, and the ornaments! I shall be looking out for ‘Lady Jane’ Cathy – apart from the flower that most considerate short stem appeals 🙂 Your glass of seasonal goodies really encapsulates the festive season. I love the color of that Hippeastrum. 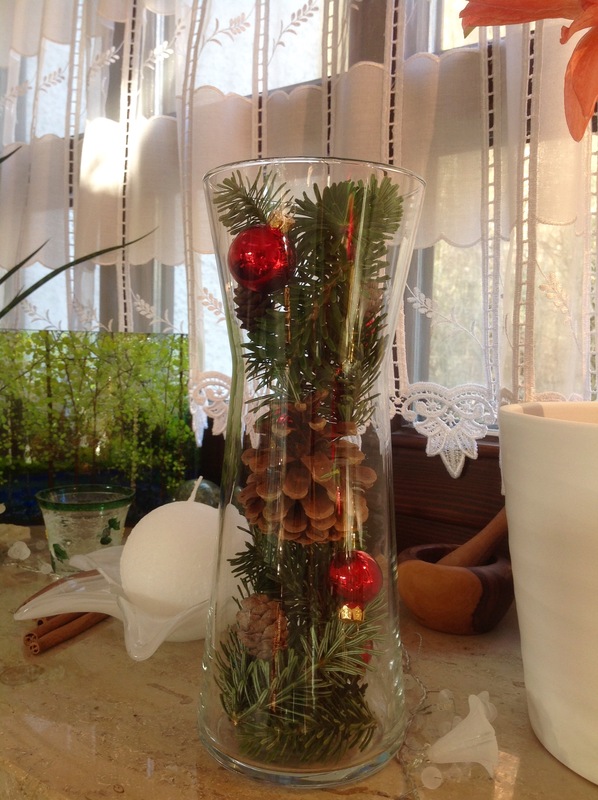 The cones and evergreens are indeed very seasonal in a tall glass vase!